Night School, the racing industry’s free national online fan education program, celebrates its 100th lesson Tuesday night when the topic of discussion will be “Boutique Meets.” The in-depth analysis of the short, high-quality racing meets that dot the racing calendar takes on added importance this week with the openings of Del Mar on Wednesday and Saratoga on Friday. Night School’s 40-week seasons of fan education began in 2011, and this 20th of 40 episodes in 2013, marks a historic milestone of 100 lessons offered. To celebrate the occasion, Night School co-founders Jeremy Plonk and Joe Kristufek are joined by original Night School cast member Caton Bredar for a video reflection of program’s favorite moments. The 90-minute live chat begins at 8:30 p.m. ET and will feature video input on handicapping “Boutique Meets” from Bob Neumeier of NBC Sports and Horse Player NOW, Maggie Wolfendale of NYRA, Jay Privman of Daily Racing Form, trainers Doug O’Neill and Bob Baffert and Del Mar’s Chris Bahr. Horse Player NOW’s Brian Nadeau also weighs in on his home track of Saratoga in the latest installment of “Nadeau’s Minutes.” Interacting with the fans in the live chat and Q&A will be Kristufek and Plonk, along with special guests Jason Blewitt, television host at Saratoga as part of NYRA’s highly acclaimed broadcast team and TVG’s Simon Bray, a former trainer on the So. Cal circuit. The Tuesday night presentation also will include a look ahead at Del Mar’s opening day card on Wednesday, and as a “thank you” to the fans for reaching 100 Night School lessons, everyone in attendance will receive a free copy of Plonk’s full-card selections for the opener “Where the Turf Meets the Surf”, and complimentary BRIS past performances for the featured Oceanside Stakes. The Night School Tour of on-track handicapping and wagering seminars will be on hand at Del Mar on Wednesday for opening day as part of the America’s Best Racing Fan Hub. At the Racing 101 area, fans can learn and meet Night School’s Jill Byrne, along with fan educators Tim Brannan and Brandi Goode. 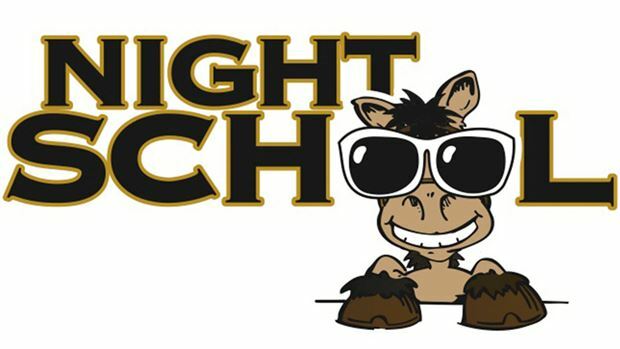 (Updated Night School Tour schedule: http://horseplayernow.com/10-night-school/5-night-school-tour).